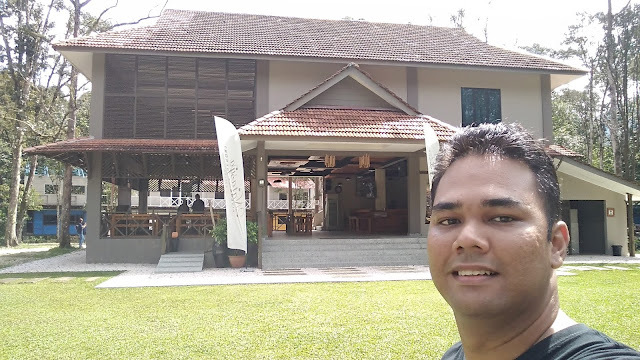 Being Jean Gallyot: A Fun Filled Weekend at Natasya Riverside Resort, Gopeng! Gopeng is a small township about 20 kilometers south of Ipoh in the state of Perak, Malaysia. With a mere population of just over 100,000 people, this township was once bustling with miner's looking to strike it rich during the tin mining era of the 1980's. Today, all that's left are remnants of it's rich history. 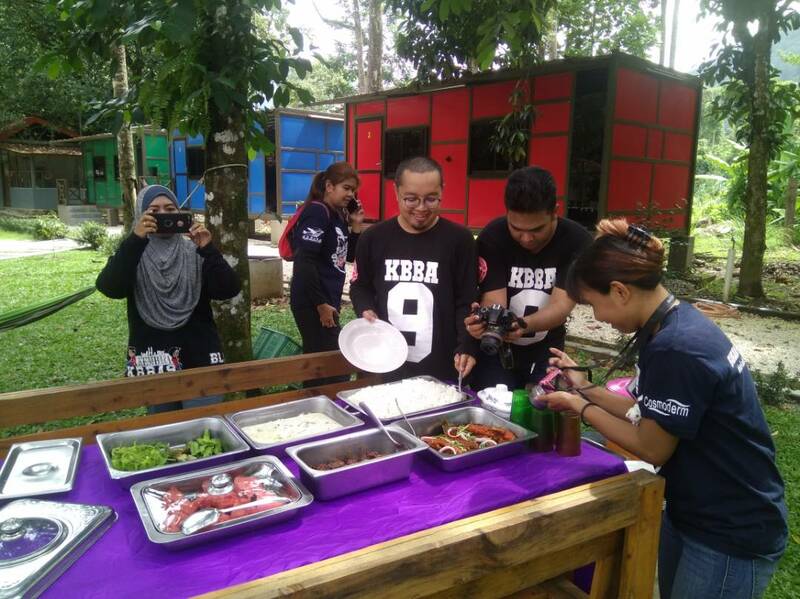 Over the weekend, a couple of my fellow bloggers and I traveled to Gopeng to check out a quite newly established resort nestled amidst lush greenery and fruit orchards. Natasya Riverside Resort Gopeng was our destination for the weekend and boy let me tell ya! It was a gastronomical weekend indeed!!! (no pun intended). 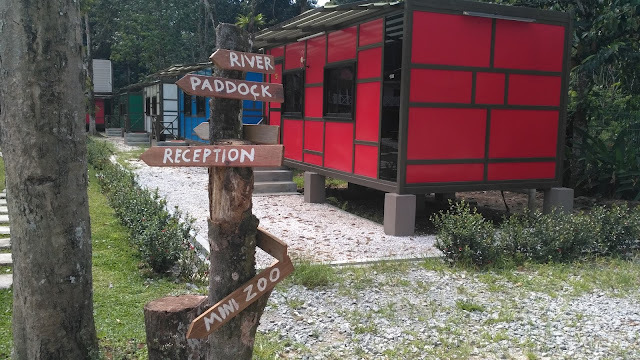 The resort is only around a 10 minute drive from the Gopeng toll plaza and is easily accessible via normal vehicles. Natasya Riverside Resort is built in an around fruit orchards, thus giving you the real village feel whilst staying there. 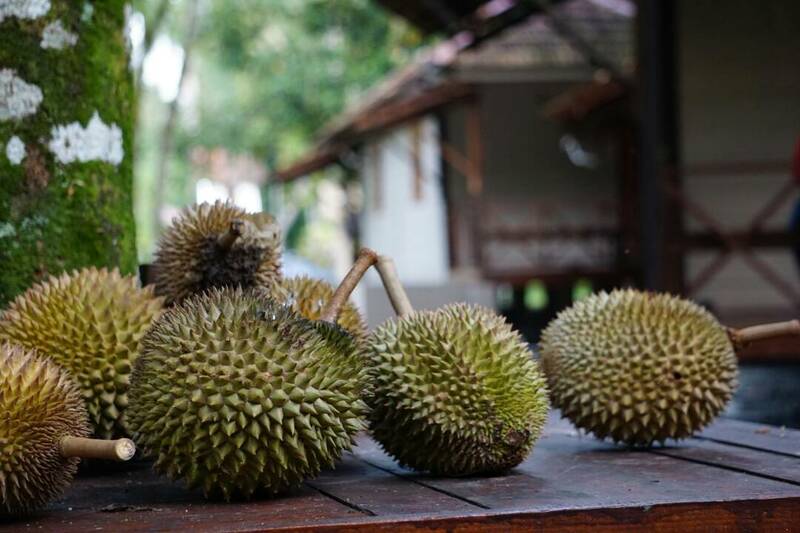 Among the favorites for visitors here would most certainly be the KING of all fruits, the GLORIOUS DURIAN!!!! Durian's are in abundance here and we were surrounded by them literally. 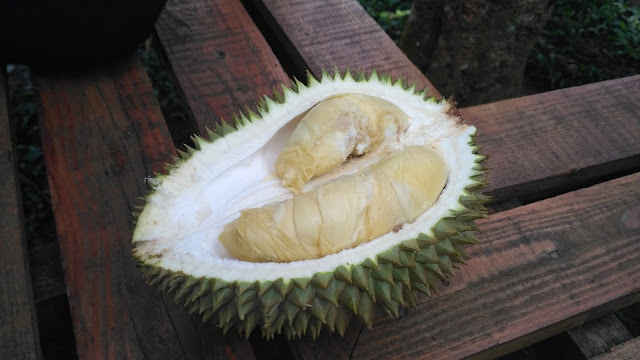 Though I am not a huge durian fan, there was something about the smell of these durians that attracted me, I just had to try one ( and about 5 more after that. hahaha). 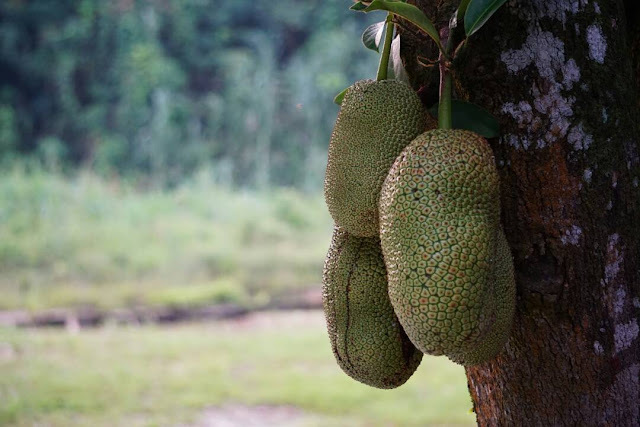 Within the grounds of the resort there were also a bunch of Jack Fruit trees so u can only imagine how much fruits we downed during our 2 Days 1 Night stay here. 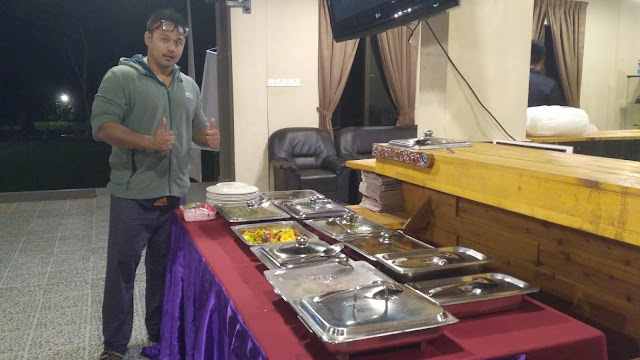 Meals here are also catered for you and they are mostly "kampung styled" dishes. Since we arrived close to noon, lunch was served soon after. Dinner on the other hand was a mixture of local cuisine with a little honey barbecued chicken and franks. This however was served at the Lobby / Hall area as we wanted to have a small Karaoke session thereafter. 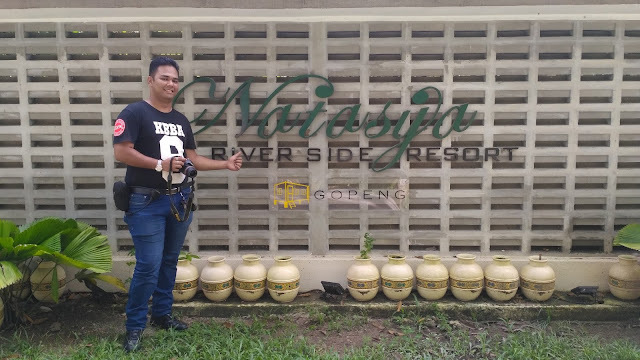 Natasya Riverside Resort, Gopeng isn't just known for it's food, fruits and great hospitality but also for the numerous activities that you are able to do within their compound as well as the surrounding areas. Kampung style and fresh fruits, awesome! Exactly... Brings back memories of my late grandmothers dusun in malacca. 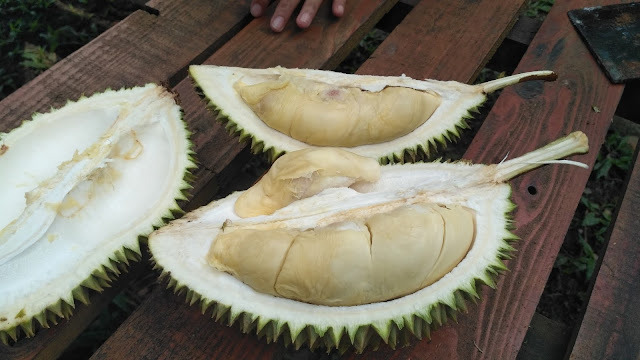 Seronoknya korang dapat makan durian. Best tol la makan. Hahaha.. Tambah tbah ada durian.